Juvenile pilocytic astrocytomas occur more often in children and young adults. They are the most common astrocytic tumors in children, accounting for 80-85% of cerebellar astrocytomas and 60% of optic gliomas. These tumors are usually discrete, indolent lesions associated with cyst formation. The cysts may be unilocular or multilocular, with an associated tumor nodule. Juvenile pilocytic astrocytoma (JPA). Axial T1-weighted MRI without intravenous gadolinium contrast enhancement shows a cystic JPA in the right cerebellar hemisphere (same patient and tumor as in the next 2 images below). Juvenile pilocytic astrocytoma (JPA). Axial T2-weighted MRI shows a cystic JPA in the right cerebellar hemisphere. The fluid in the cyst has a higher signal intensity than that of the solid component. Peritumoral vasogenic edema is present. Juvenile pilocytic astrocytoma (JPA). 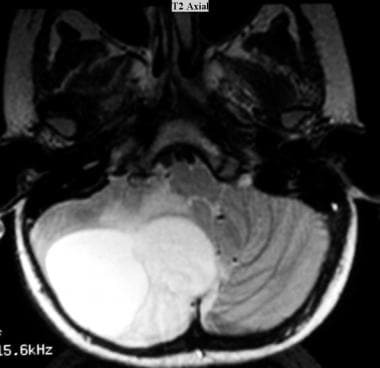 Axial T1-weighted MRI obtained with intravenous gadolinium-based contrast agent shows a cystic JPA with an enhancing component in the cyst in the right cerebellar hemisphere. Pilocytic astrocytomas are typically treated with surgery; MRI scans are useful in outlining the contrast-enhancing tumor. The tumor should be completely resected whenever possible. Cyst wall enhancement may be seen on MRI scans; when such enhancement is present, resection of the entire cyst is indicated. [18, 19, 20, 21, 22, 17] Use of radiologic findings alone to identify low-grade gliomas results in an incorrect diagnosis in as many as 50% of cases. In patients in whom tumor resection is incomplete, the clinical course is often benign; postoperative stabilization of the disease is achieved, despite positive findings of tumor in surgical margins. For this reason, postoperative radiation therapy in these patients is controversial. Frequent follow-up with MRI is helpful. Juvenile pilocytic astrocytomas may occur anywhere in the central nervous system. On CT scans, these astrocytomas cannot be reliably differentiated from other more diffuse or aggressive tumors on the basis of imaging characteristics alone. CT scans may show hypoattenuating areas, isoattenuating areas, or both. Enhancement varies from none to extensive, with varying degrees of necrosis and cyst formation. Supratentorial malignant glioma, ependymoma, and oligodendroglioma may have similar appearances. Lower-grade tumors tend to be homogeneous and well circumscribed. Peritumoral edema is mild, and no hemorrhage is present. Higher-grade tumors have more surrounding edema, are more heterogeneous in density, and may have areas of hemorrhage. 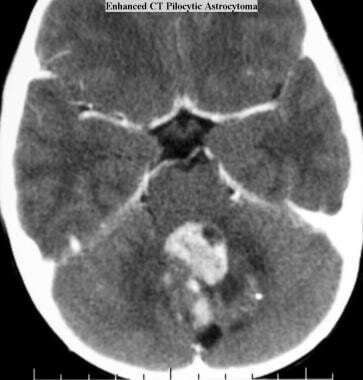 A CT scan of a juvenile pilocytic astrocytoma is provided below. Juvenile pilocytic astrocytoma (JPA). Axial CT scan obtained with intravenous contrast material shows a contrast-enhancing JPA with cystic components in the cerebellum. A subset of astrocytic tumors occurs in patients with NF1. These tumors may involve the optic nerves, the optic chiasm, and the optic tracts. Most are juvenile pilocytic astrocytomas, but their imaging characteristics are not specific with regard to their histologic features. Varying degrees of cystic change and enhancement are demonstrated. These tumors may appear smooth, fusiform, eccentric, or lobulated. CT scanning demonstrates the intraorbital optic nerves and is sensitive in the detection of the tumors. About 20% of juvenile pilocytic astrocytomas have microscopic calcifications; these calcifications are less frequently seen on CT scans than on other types of images. Among pediatric tumors of the posterior fossa, astrocytomas are second in frequency only to medulloblastoma. Approximately 75% of cerebellar astrocytomas are of the pilocytic type; imaging does not help in predicting their histologic features because fibrillary forms may have similar appearances. Imaging characteristics are most typical for cerebellar tumors during the first decade of life. The typical presentation of a juvenile pilocytic astrocytoma is of a large cerebellar hemispheric or vermian mass that is predominantly cystic in a child younger than 10 years. Nonenhanced CT scans show hypoattenuation or isoattenuation. Tumor contrast enhancement is homogeneous or heterogeneous, depending on the extent of the cystic necrotic changes. On T1-weighted images, the signal intensity is generally low; on T2-weighted images, the signal intensity is increased. Enhancement patterns are similar to those depicted on CT scans. MRI images of juvenile pilocytic astrocytomas are provided below. Juvenile pilocytic astrocytoma (JPA). Sagittal T1-weighted MRI obtained with intravenous gadolinium-based contrast agent shows a JPA with enhancement in the hypothalamic area. Optic chiasm hypothalamic gliomas cannot be distinguished on the basis of their site of origin and are considered to be a single entity. On T1-weighted images, the signal intensity is low. On T2-weighted images, the signal intensity is generally increased. The increase in T2-weighted signal intensity may extend as far as the optic radiations, but such findings do not correlate directly with the presence of tumor. Enhancement is similar to that seen on CT scans. Use of fat-saturated T1-weighted postcontrast MRI of the intraorbital optic nerves is a sensitive method for demonstrating the tumor. The signal intensity is low with T1-weighted sequences and high with T2-weighted sequences. Enhancement patterns are similar to those seen on CT scans. MRI is less sensitive to calcium than is CT scanning. 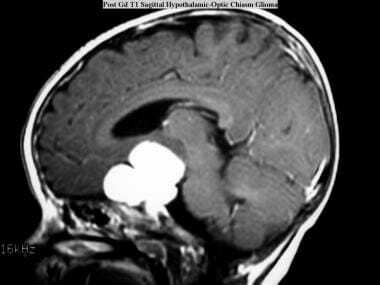 Vermian tumors are often associated with hydrocephalus. Three general tumor patterns are found. Less than 10% are solid. These tumors may enhance in a homogeneous or a heterogeneous fashion. Approximately 50% are simple cysts with a single mural nodule. On CT and MRI scans, the nodule enhances homogeneously, but the associated cyst wall usually does not. Likewise, no histologic evidence of tumor is present in the cyst wall. For this kind of tumor, removal of the mural nodule may be sufficient for treatment. About 40-45% consist of multilocular cysts. These are actually necrotic tumors; they have a cystlike appearance. The periphery or cyst wall enhances. Histologic evidence of tumor is present in the cyst wall. Cure requires resection of the entire wall. Imaging shows clear-cut enhancement of the non-necrotic portions of the tumor. Gadolinium-based contrast agents (gadopentetate dimeglumine [Magnevist], gadobenate dimeglumine [MultiHance], gadodiamide [Omniscan], gadoversetamide [OptiMARK], gadoteridol [ProHance]) have been linked to the development of nephrogenic systemic fibrosis (NSF) or nephrogenic fibrosing dermopathy (NFD). For more information, see the eMedicine topic Nephrogenic Systemic Fibrosis. NSF/NFD has occurred in patients with moderate to end-stage renal disease after being given a gadolinium-based contrast agent to enhance MRI or MRA scans. NSF/NFD is a debilitating and sometimes fatal disease. Characteristics include red or dark patches on the skin; burning, itching, swelling, hardening, and tightening of the skin; yellow spots on the whites of the eyes; joint stiffness with trouble moving or straightening the arms, hands, legs, or feet; pain deep in the hip bones or ribs; and muscle weakness. For more information, see FDA Information on Gadolinium-Based Contrast Agents or Medscape. Specific findings on MRI may be suggestive of juvenile pilocytic astrocytomas, but they are not diagnostic for this disease. Metastatic disease, neoplasm, and high-grade glioma cannot be excluded on the basis of radiographic findings. 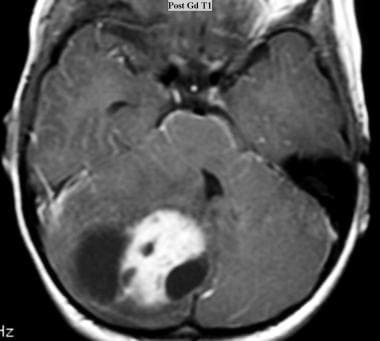 With regard to tumors of the posterior fossa, the most common possibilities in the differential diagnosis are medulloblastoma and ependymoma. Metastases are rare in childhood. Medulloblastomas are typically isoattenuating to hyperattenuating on nonenhanced CT scans. Ependymomas may extend laterally or inferiorly to the foramina of Luschka or Magendie; extension is to the cerebellopontine angle or through the foramen magnum, respectively. They are isoattenuating to hyperattenuating on nonenhanced CT scans. About 50% of ependymomas exhibit small multifocal calcifications on CT scans. The major differential diagnostic consideration for optic chiasm/hypothalamic glioma is craniopharyngioma. Angiography is usually not useful in the diagnosis of juvenile pilocytic astrocytoma except to exclude an aneurysm in the presence of a suprasellar tumor mass. Buschmann U, Gers B, Hildebrandt G. Pilocytic astrocytomas with leptomeningeal dissemination: biological behavior, clinical course, and therapeutical options. Childs Nerv Syst. 2003 Jun. 19(5-6):298-304. [Medline]. Alshail E, Rutka JT, Becker LE, Hoffman HJ. 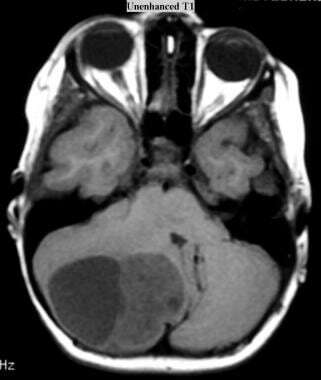 Optic chiasmatic-hypothalamic glioma. Brain Pathol. 1997 Apr. 7(2):799-806. [Medline]. Campbell JW, Pollack IF. Cerebellar astrocytomas in children. J Neurooncol. 1996 May-Jun. 28(2-3):223-31. [Medline]. Faerber EN, Roman NV. Central nervous system tumors of childhood. Radiol Clin North Am. 1997 Nov. 35(6):1301-28. [Medline]. Gajjar A, Sanford RA, Heideman R, et al. Low-grade astrocytoma: a decade of experience at St. Jude Children''s Research Hospital. J Clin Oncol. 1997 Aug. 15(8):2792-9. [Medline]. Kestle J, Townsend JJ, Brockmeyer DL, Walker ML. Juvenile pilocytic astrocytoma of the brainstem in children. J Neurosurg. 2004 Aug. 101(1 Suppl):1-6. [Medline]. Foreman NK, Gore L, Wells D, Straessle J, Heideman R, Donson AM. Gefitinib is effective against juvenile pilocytic astrocytoma in vitro. Pediatr Blood Cancer. 2006 Sep. 47(3):293-8. [Medline]. Villarejo F, Belinchón de Diego JM, Gómez de la Riva A. Prognosis of cerebellar astrocytomas in children. Childs Nerv Syst. 2008 Feb. 24(2):203-10. [Medline]. Shankar JJ, Woulfe J, Silva VD, Nguyen TB. Evaluation of perfusion CT in grading and prognostication of high-grade gliomas at diagnosis: a pilot study. AJR Am J Roentgenol. 2013 May. 200(5):W504-9. [Medline]. Collins VP, Jones DT, Giannini C. Pilocytic astrocytoma: pathology, molecular mechanisms and markers. Acta Neuropathol. 2015 Jun. 129 (6):775-88. [Medline]. Barkovich AJ. Pediatric Neuroimaging. New York:. Raven Press. 1990. Davis PC, Hopkins KL. Imaging of the pediatric orbit and visual pathways: computed tomography and magnetic resonance imaging. Neuroimaging Clin N Am. 1999 Feb. 9(1):93-114. [Medline]. Luh GY, Bird CR. Imaging of brain tumors in the pediatric population. Neuroimaging Clin N Am. 1999 Nov. 9(4):691-716. [Medline]. Linscott LL, Osborn AG, Blaser S, Castillo M, Hewlett RH, Wieselthaler N, et al. Pilomyxoid Astrocytoma: Expanding the Imaging Spectrum. AJNR Am J Neuroradiol. 2008 Aug 13. [Medline]. Kim DH, Kim JH, Choi SH, Sohn CH, Yun TJ, Kim CH, et al. Differentiation between Intramedullary spinal ependymoma and astrocytoma: Comparative MRI analysis. Clin Radiol. 2013 Sep 10. [Medline]. Ginat DT, Walcott BP, Mordes D, Schaefer PW, Nahed B. Intracranial organizing hematoma with papillary endothelial hyperplasia features after resection and involved field radiotherapy for cerebellar juvenile pilocytic astrocytoma. Clin Imaging. 2014 May-Jun. 38 (3):322-5. [Medline]. Livne O, Harel R, Hadani M, Spiegelmann R, Feldman Z, Cohen ZR. Intraoperative magnetic resonance imaging for resection of intra-axial brain lesions: a decade of experience using low-field magnetic resonance imaging, Polestar N-10, 20, 30 systems. World Neurosurg. 2014 Nov. 82 (5):770-6. [Medline]. Kollias SS, Barkovich AJ, Edwards MS. Magnetic resonance analysis of suprasellar tumors of childhood. Pediatr Neurosurg. 1991-92. 17(6):284-303. [Medline]. Lee EJ, Lee SK, Agid R, Bae JM, Keller A, Terbrugge K. Preoperative Grading of Presumptive Low-Grade Astrocytomas on MR Imaging: Diagnostic Value of Minimum Apparent Diffusion Coefficient. AJNR Am J Neuroradiol. 2008 Aug 21. [Medline]. Komotar RJ, Zacharia BE, Sughrue ME, Mocco J, Carson BS, Tihan T, et al. Magnetic resonance imaging characteristics of pilomyxoid astrocytoma. Neurol Res. 2008 Jul 25. [Medline]. Hirai T, Murakami R, Nakamura H, Kitajima M, Fukuoka H, Sasao A, et al. Prognostic Value of Perfusion MR Imaging of High-Grade Astrocytomas: Long-Term Follow-Up Study. AJNR Am J Neuroradiol. 2008 Jun 12. [Medline]. Krishnan AP, Asher IM, Davis D, Okunieff P, O'Dell WG. Evidence that MR diffusion tensor imaging (tractography) predicts the natural history of regional progression in patients irradiated conformally for primary brain tumors. Int J Radiat Oncol Biol Phys. 2008 Aug 1. 71(5):1553-62. [Medline]. Nguyen TB, Cron GO, Perdrizet K, Bezzina K, Torres CH, Chakraborty S, et al. Comparison of the Diagnostic Accuracy of DSC- and Dynamic Contrast-Enhanced MRI in the Preoperative Grading of Astrocytomas. AJNR Am J Neuroradiol. 2015 Jul 30. [Medline]. Disclosure: Received honoraria from AbbVie for consulting.